I'm in full-on holiday mode now, which means I'm giving Christmas-y makeovers to some of my favorite recipes. I have another peppermint and chocolate combination coming at you next week, but I thought I'd share these waffles first - weekends are made for indulgent breakfasts, after all. Though I've never blogged them before, my go-to recipe for waffles is the Waffles of Insane Greatness. I've made them a million different ways too - plain, chocolate chip (Joey's favorite), blueberry (my favorite), strawberry, gingerbread, pumpkin, chocolate... but these eggnog waffles reign supreme right now. To be honest, I used to hate eggnog. As a child, I thought it tasted weird, thick, and yucky. Now, while it may not be my number one drink of choice, I enjoy a small glass here and there throughout December. And I love eggnog-flavored treats. 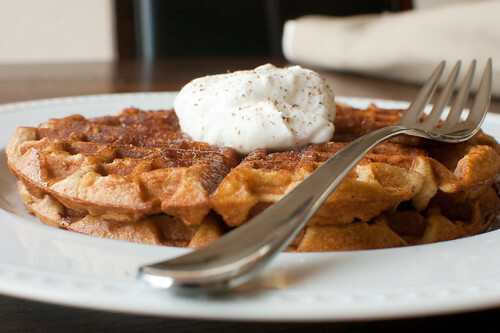 To make these waffles, I just took the standard base recipe and replaced the milk with eggnog, added some nutmeg and cinnamon, and spiked the batter with some bourbon. I served these with maple syrup, some freshly whipped cream, and a sprinkling of nutmeg. The result was a wonderfully festive waffle. I froze the ones we didn't eat, so we have another festive breakfast waiting for us this weekend. And as an aside, does anyone have a waffle iron they love and would recommend? Mine is not the best, and it's on it's last leg! In a medium mixing bowl, whisk together all the dry ingredients. In a large mixing bowl, whisk together the wet ingredients. Add the dry to the wet, and stir until just combined - be sure not to overmix! Allow the batter to sit for 30 minutes. Preheat the waffle iron and cook the waffles according to the manufacturer's instructions. Serve immediately with maple syrup, whipped cream, and nutmeg. Mmm, love the holiday adaptations! I'm not a huge eggnog fan either but these I could get into! I have a cheapie waffle iron (a rectangular one) from either Target or Walmart and I love it. It was less than 20 bucks and makes perfect waffles. these look amaaazing! As for waffle makers, we've used a Krups one for the past 10 or so years that works fine--no complaints! Also, any clue why the batter must rest 30 min? This is about to be my new favorite dessert! 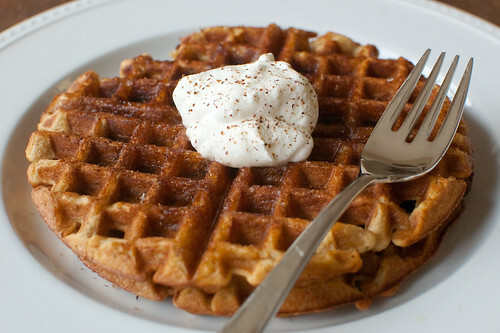 so putting an eggnog spin on waffles this weekend. what a great idea and our fridge is stocked with soy and regular eggnog! hope you're enjoying the holidays, josie! bourbon and eggnog in the form of a waffle?! you are a genius! I love egg nog, too, especially if it has bourbon in it! I love waffles--can't wait to try these. Regarding a waffle iron, I have the outrageously expensive Kitchen Aid 2 waffle waffle iron (luckily I got it as a gift). I LOVE it--it makes the best waffles. Since you flip it, the waffles get crispy on the outside, but stay light on the inside. I used to not like eggnog as a kid as well, but now i enjoy it. I do love holiday inspired creations like this. Sounds like a very festive way to start out a weekend before a day of wrapping, shopping, sledding, etc.! Yum! Your posts never disappoint. I especially love the Christmasy dishes! I made these for breakfast this morning...delicious! I love eggnog, but my husband is not a fan. I didn't tell him what the batter consisted of until he started eating them and said that he really liked them. :) Thanks for this!! This is going on my meal plan for next week! I am super excited. It gives me an excuse to buy rum too! I googled "festive waffles" and this article came up. These eggnog waffles sound delicious. We use a "Waring Pro" waffle maker that the inlaws gave us a few years ago. I absolutely love it and I really am the waffle pro when I use it. Hi Pam, sure you can leave it out with no problem - I would just add a bit of vanilla extract in its place - maybe 1/2-1 teaspoon. Can't wait to try these. Such a great idea! You have to get the Waring Pro Belgian Waffle Maker. It is the best, period. You will love it. I bought one for Ben's dad a few Christmases ago and last year we finally got our own. It is awesome! Looks fab, but i must admit, I'm starting to get a little overloaded w/ all the eggnog and mint! I think we need to mix it up and make Christmas the holiday of oranges to add some health to all this! haha. Made these and they are very yummy! I doubled it, but did not double the oil. We didn't use all the batter the first day and the batter kept well in the fridge. I had the last one as a dessert waffle w/dulce de leche spread on top- so good! Thanks for the recipe. I used my homemade rum-vanilla extract (just vanilla beans in some light rum, left to stew for a few months). I also added a touch of rum flavoring. Hi, I just made these today. What a hit! I just posted them on my blog and linked back to your site. Happy New Year and thanks for the great recipe!